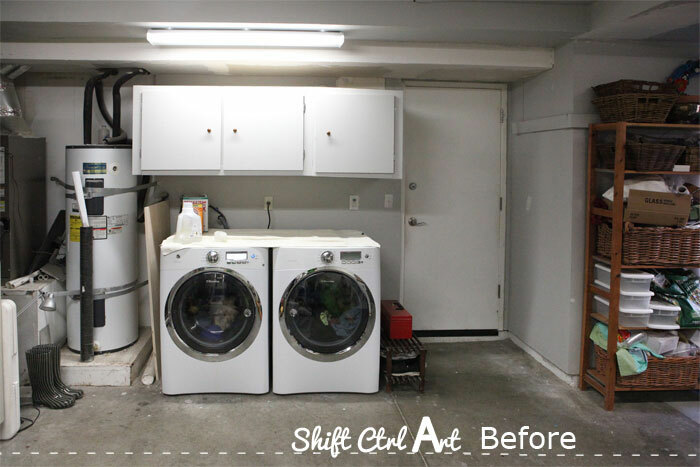 This is our laundry room. 'Room' is actually an overstatement. It's more like a nook. In the garage. We made over this nook in the spring, then I snapped a few pictures on our way out the door to a weekend trip at El Capitan. While the weekend trip was awesome, I didn't so much end up liking the pictures of our nook. Or the door color. Especially the door color. You can file this under the first thing I would not to again: a turquoise door with a yellow wall. If I get that idea in the future, please go ahead and just stop me, because I won't like the result. Probably before the paint is even dry. 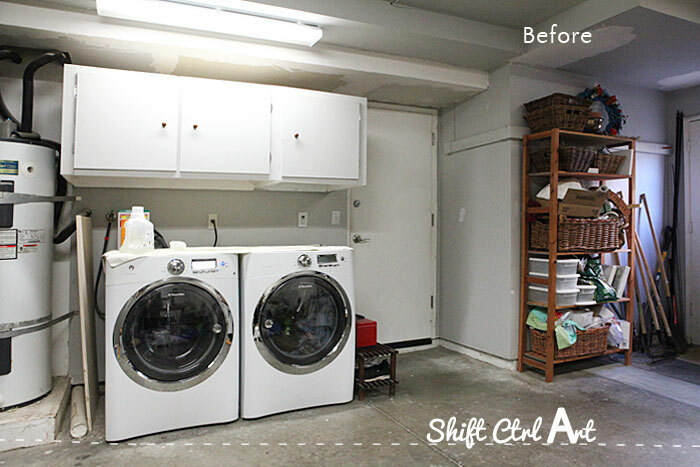 Here is what the laundry nook looked like before we made it over. Before it was even a nook. Then we made it over. I drew up some plans and we hired our handyman to do some of the heavy lifting. Then we did the rest ourselves. Skipping over the turquoise door, here is where we are now. With a black door, which I like so much better. I painted it with chalk paint again, but even just regular black would have been great too. This is really a great DIY and even better, you can mix any paint with some non-sanded grout and voila, you have instant chalk board paint. I wrote more about that process here when I painted it turquoise. Frank and I made that blond wood mat, and I love the way it looks. I love the wood tone, that it was inexpensive to make and the overall look and feel of it. I am still going to put it on the "wouldn't repeat" list, and here is why: it's simply not that sturdy. Not that it is totally UN-sturdy either. We have used it for 6 months and it is still holding up very well, but it does have a certain, uhm, sway, to it when you step on it. I think design should be functional as well as pretty. It's a thing I have. So re-do. Sometime. I want to work more on this idea. I think if a router had been involved, it would have turned out better. We will see. My wheels are turning a bit more on this project. For now, I definitely would not repeat it in exactly this way. Every laundry room should have clothes pin art, right? Somewhere. Anywhere. I think it's the one room where you can really get away with it. I made that double circle of clothes pins for our wall behind the chalk door. You can read more about how I did that here. No glue either. It's almost magic. 3 - DIY table top with a striped edge and matching tool rail. The stripes are optional of course, but I do love having a solid surface to fold clothes on. I added some contrasting white stripes to the front edge of the black tabletop and repeated it on the tool rail that wraps around the wall, for some extra interest. You can see how the tabletop was built here. There is a lip in the back, so no sock will fall down behind the washer and dryer. Below you can see our tools hanging neatly from some s-hooks from the tool rail. Let's talk about these s-hooks for a minute. I searched high and low for some s-hooks, but I could never find these exact ones, so I ended up buying them online in Denmark, having them shipped to my parents and then brought back here. They are nothing fancy, just regular s-hooks. Only they are not giant, nor are they some ugly color, nor are they plastic. They are metal, with some plastic tubing to hold the tools in place. As an s-hook should be. I clearly spent more than an appropriate amount of time on these s-hooks. Sometimes I can really obsess about the little details. It's completely normal. 4 - Chevron wall with birds. This chevron wall just makes me happy. I love the yellow color. It's the most gray, green yellow that I could find by Valspar and it's called Dylan Velvet. We had our handyman build the two wing walls here and here that the table top is fastened to. Then he put up the chevron wall and painted it. I added some of these paper birds to it. We also had a shelf added to our nook, above the washer and dryer. It serves as both a spot to hold some soap and powders as well as decorative items and it holds the ruffled curtain underneath. The ruffled curtain adds a bit of softness to an otherwise hard space. It also hides all the plumbing and outlets for the washer and dryer. Here is how I made it. I love the look of it with the shelf. I had originally thought about using some turquoise and white fabric, but it ended up being too much. I am glad I went with this natural and neutral fabric instead. However, in full disclosure and all that, the third thing I would not repeat is getting a lemonade dispenser for soap, even if you get in on sale. It sure is pretty, but if you are someone who is in a hurry to get things done - especially when it comes to laundry, the soap just takes waaaaaay too long to come out. It does come out eventually, but not with any type of recognizable speed. Wouldn't it be great if laundry soap came in pretty containers. I bet if they hired a product designer or something they could come up with something that looks a little happy on a shelf. I love the idea of a dispenser like this, but something with better function would be oh so nice. We have talked about adding a couple of shelves behind the wing wall on the left for soap containers to solve this issue. 7 - Spray painting a light fixture gold. This was such a great DIY. Buy a dirt cheap light fixture with a great shape to it, then spray paint it a nice color. I chose gold to add some warmth. I am very happy with how this turned out. There you have it. 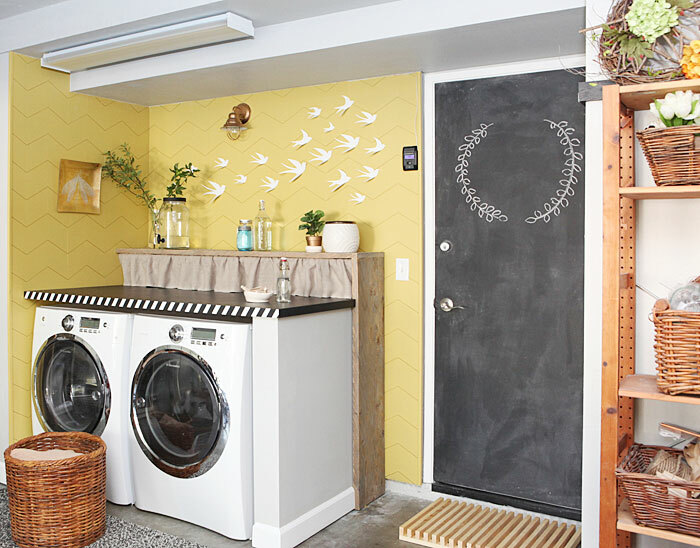 7 DIY projects we did in this nook that I am a big fan of and those 3 that we probably wouldn't repeat, or if we did, then in a different way somehow. This marks the third (and final) space I have re-visited this year in a smaller or bigger way because it just got too colorful. I love color, but too much of a good thing is still just too much of a good thing. The other two spaces are the patio that I just toned down and the entry hall which got a complete make-over earlier this summer. 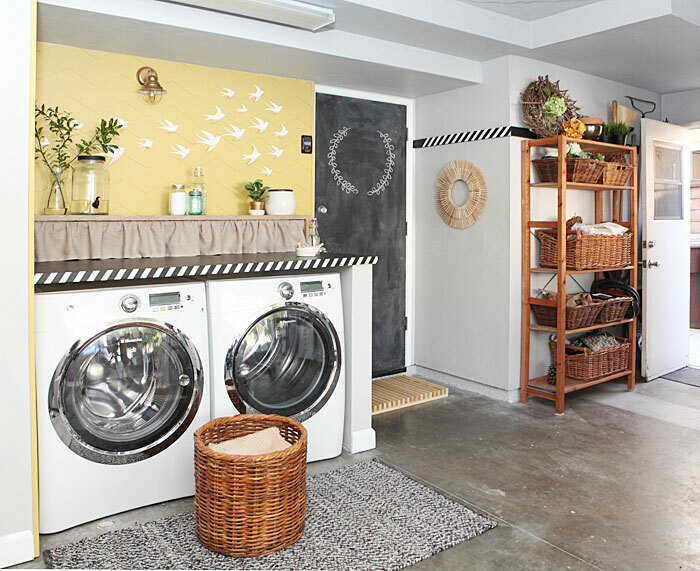 This article: 7 DIY ideas for a laundry nook in the garage - and 3 things I wouldn't repeat first appeared on http://ahomefordesign.com.